These cookies are so easy to make and very child friendly when it comes to little hands wanting to help. Start by making your cookies using your preferred cookie recipe. We chose Aunty Kath’s pre-made cookie dough which you can get in the cold section at Coles. 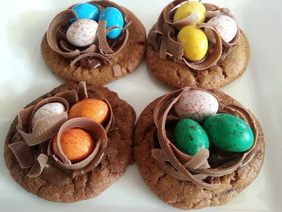 After your cookies have cooled, smear Nutella on top of the biscuit and place your eggs on. The Nutella as well as being super yummy helps the eggs to stay in place. Now add some strips of chocolate around the eggs for the nest. We used a vegetable peeler to get the effect we were after. Serve with a twitch of your nose and a hop in your step.